Ladies, you know that feeling you get when something just isn’t right, a feeling that causes you to react almost immediately. You start your research, tell your girls to put on their investigator hats and go incognito mode? Yup, there’s nothing more powerful than a woman’s intuition. For many of us we’ve used our intuition to expose our partners infidelities and wrong doings, and to expose people who no longer needed to be in our lives. When it comes down to explaining how we knew it’s always “I just knew” “something told me things weren’t right” “I just had a feeling” and the list goes on. We come to rely on this sense to guide us through relationships, especially intimate/romantic ones. Often times though, it’s not our intuition that leads us to investigate or suspect that things aren’t right; our insecurities come masked like a thief in the night. Our insecurities and issues from the past can easily cloud judgment and make us look for things that aren’t there. It’s important that you don’t get these two feelings mixed up and ask yourself, “is it my insecurities talking to me or my intuition“. It’s normal to have insecure moments, never allow someone to tell you that you aren’t allowed to feel a certain way. It’s one thing to have a moment, and another to act on that moment. When you have been hurt and done wrong in the past you will have doubts, you will question everything, and you will have moments where your new relationship will seem too good to be true. Don’t let your insecurities ruin a good relationship and don’t be manipulated into staying in a bad one either. It’s difficult to pinpoint when you are being logical and when you are reacting off emotions sometimes, just like it’s difficult to know when you are being told a lie vs the truth. Let’s admit it, some people are just great liars and will have you second guessing everything. It’s important to know your worth and know what you are willing to accept as the truth when it comes to relationships. A gut feeling is a subtle emotional reaction but your mind has to be in the right place in order for you to sense it and apply it correctly. You have to know yourself extremely well in order to interpret intuition and previous relationship baggage has to be resolved before you can know if your intuition is truly telling you something. Being able to tell the difference between the two depends on your situation and you as an individual, your past and present all play a role in how you handle things. 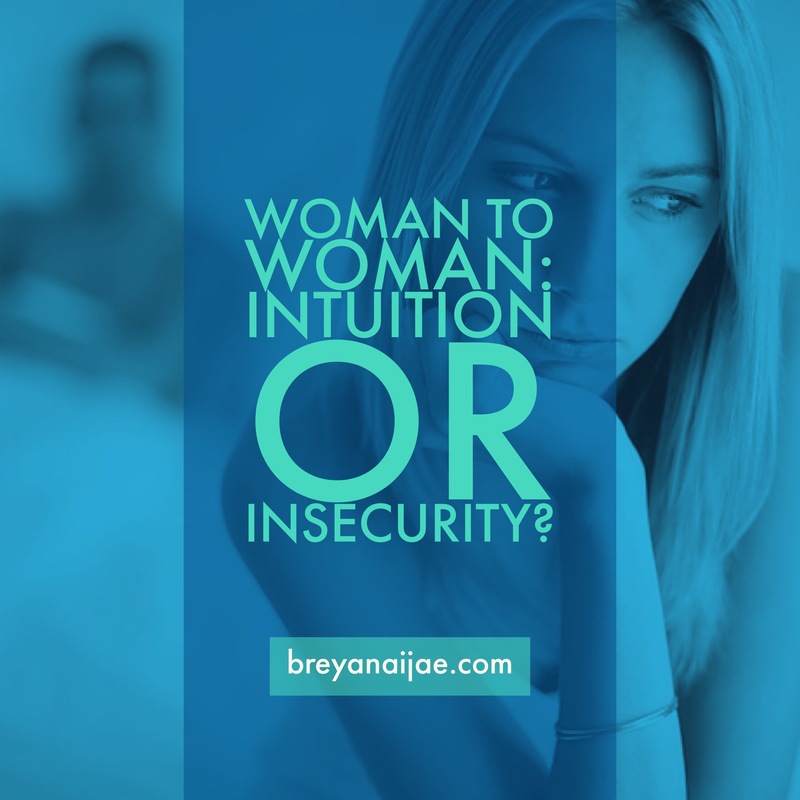 Do not feel like it has to be one or the other because often times it’s both your intuition and insecurities at the same time. Your intuition can tell you someone isn’t worth your time while your insecurities will say it wouldn’t have worked anyway. If you feel like something is really wrong, more than likely it is. These feelings don’t just pop out of thin air but make sure you have the necessary facts and evidence so it doesn’t look like you’re nagging for nothing. A guy will throw the “you’re being insecure” card in a heartbeat to justify his actions, especially if he’s doing wrong and doesn’t want you to find out. Now if you’re calling and texting him every hour on the hour because you’re trying to make sure he isn’t with another female then that’s a problem and you’re being very insecure and should handle some inner issues that may be brewing. If you’re unhappy with yourself then you can never be happy with someone else. If you have a bad feeling about a relationship keep your cool, proceed with caution, and gather your thoughts and concerns before you approach your partner. What guys fail to realize is that their actions often times causes a female to become insecure and less confident about herself and the relationship and vice versa, males can be insecure as well. Most importantly, take it easy on yourself and approach every situation mindfully. Talk things through with your partner before you jump to conclusions and get to the bottom of things first and foremost. Know your worth, know what you are willing to accept. Today, my message to you is to never let a man bring you to a level that is beneath you. Know that your happiness does not lie in the hands of anyone else but YOU. I can hand you a list right now of all the things and people who have hurt me and done me wrong, sometimes I become doubtful and sometimes my insecurities get the urge to surface, but my hurt is only a future testimony of success. Don’t ignore the signs, be mindful, and don’t be naive. Don’t let your insecurities win and know when your intuition is talking to you. A Quick Guide: Putting Your Plans Into Action!